Are you an Expo? Do you feel overwhelmed and constantly in the weeds? Here’s a quick way to make yourself more effective and spend less time weed whacking. 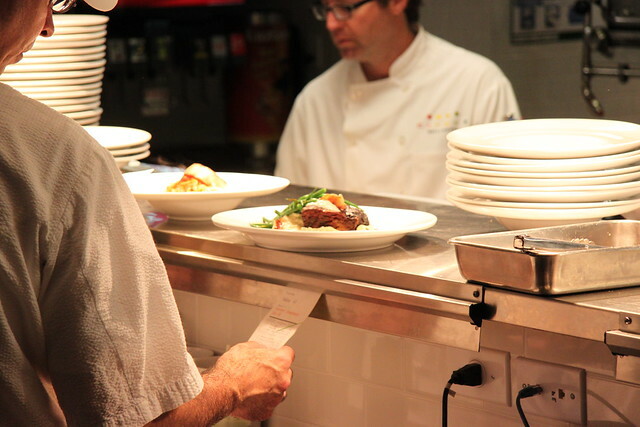 Simply put your plates in a position by their chit/ticket order. Leave an empty space for the ones you are waiting for. This is an easy way to tell where your chits/tickets are at a glance. For example, say you have a six top order. The simplest plate layout would be from left to right. Let’s say the chit/ticket from top to bottom is Chicken Parmesan, Salmon, Steak, Lasagna, Chicken Alfredo, and Tilapia. You are missing the Steak and Tilapia. It’s much easier to keep track of plates and know what you are missing this way. Otherwise, you’ll be spending lots of time going through the ticket over and over again to match what’s in the window. Only last bit, once you determine your layout, make the kitchen use it too. It will save both of you time since both can tell where an order is at a glance. Posted in Back of House, Front of House, How To, Restaurant, Service.